George Osborne must have stood up for his Budget Speech with the sound of 'Pasty Tax' and 'Granny Tax' ringing in his ears. The aim this time round must surely have been to avoid handing the Labour Party a catchy-sounding stick to beat him with. Sadly for Osborne, he failed. Shadow Treasury Minister Catherine McKinnell last night identified the dangerous phrase that could ostracise around half of the voter population: The Mummy Tax. She said an attack on mums was hidden in the small print of the statement. So what has she found? McKinnell is highlighting that two of the benefits which will only increase by 1% a year for the next three years are maternity allowance and statutory maternity pay. Statutory maternity pay is currently six weeks at 90% of your average weekly earnings, then 33 weeks at either £135.45 or 90% of your average weekly earnings (whichever is lower). The maternity allowance is designed for women who do not qualify for SMP, and is £135.90 or 90% of your average weekly earnings (whichever is lower) for the whole period. The weekly sum will only increase by 1% for the next three years - so after inflation will constitute a cut. It means that instead of getting an inflationary increase of £3 a week in April, mums will receive just £1.35 more. McKinnell may have been alerted to the small print by Mark Ferguson, editor of the Labour List blog, who tweeted during the statement "Does benefits only being uprated by 1% include statutory maternity pay? If so we have the new ‪#grannytax‬ - the ‪#mummytax‬". She took up the cry, saying last night: "In the budget the small print was the granny tax and in the Autumn Statement the hidden detail was George Osborne's mummy tax, as maternity pay is cut in real terms." The issue, she argues, is that the cap on benefit increases was supposed to be designed to ensure work always pays - so that those who choose a life on benefits suffer the consequences. However, these benefits are not designed for those living on benefits for life - they are for women taking much-needed time out to care for a newborn. She said: "The government claims they are targeting the work-shy and benefit scroungers, but it's just not true. They are hitting millions of working families, and mums taking time out from work to look after their new born baby." The move is expected to further ostracise women, who the opposition argue are increasingly marginalised. Yvette Cooper MP, Labour's Shadow Minister for Women and Equalities, responding to the Autumn Statement, said: "House of Commons library analysis shows women will be hit four times harder by the new direct tax, tax credit and benefit changes they have analysed. Despite repeated warnings from women across the country that his budgets are disproportionately impacting women's incomes, George Osborne and David Cameron keep coming back for more to pay for their failure to get the economy growing. " TUC General Secretary Brendan Barber agrees: "For all the Westminster talk of fiscal rules and structural deficits, it is money at home that matters to families, and that's where they've been hit harder than anyone else." The pain is clearly going to be felt gradually, over the next three years, the question is whether Labour can drum up an outcry now. They are certainly trying. LabourList asked "Will #mummytax become the new #grannytax ?" A number of Labour politicians have taken up the hashtag on Twitter, including John Prescott (who garnered 91 re-tweets), Jonathan Ashworth, and Bridget Phillipson. 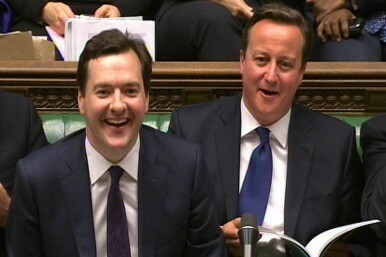 Some users took up the cry, with one saying: "So Coalition have cut child benefit and now maternity pay. Would their last female voter please turn off the light as they leave. ‪#mummytax‬." Stefan Stern, the management writer and a visiting professor at Cass Business School tweeted: "I think we are going to hear the phrase "failing the fairness test" a lot over the next couple of years. ‪#mummytax‬ ‪#guffawingGeorge‬". However, Osborne appears to be largely getting away with it. The cunning plan to bring in slow rises - and thereby hide a real-terms cut - means we're not feeling any additional pain right now, and there's no cut in the future we can easily identify. Labour can continue flogging the Mummy Tax, but we clearly don't care half as much about this as we did about our pasties. But what do you think? is this fair? let us know in the comments.